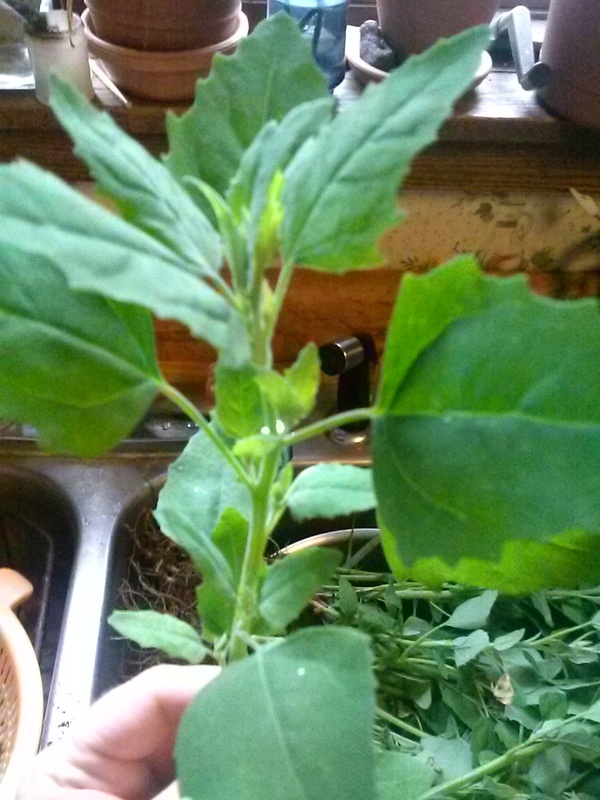 I discovered Lamb’s Quarters were edible last year. I have seen them as weeds in my gardens throughout the years. They are delicious, with a spinach-like flavor. I liked them so much last year that I bought seeds for this year so I’d have more. I didn’t end up needing to plant them. I have a ton growing all over my back garden plot this year. They typically grow in open spots in cultivated gardens. They were brought over to the U.S. by European settlers many years ago and have naturalized – they are supposed to be found throughout the country now. They are related to spinach. They were very popular throughout Europe, and then in the 1600s Spinach was introduced from Asia; People started growing spinach instead. My guess is that they found the spinach a lot less labor intensive. 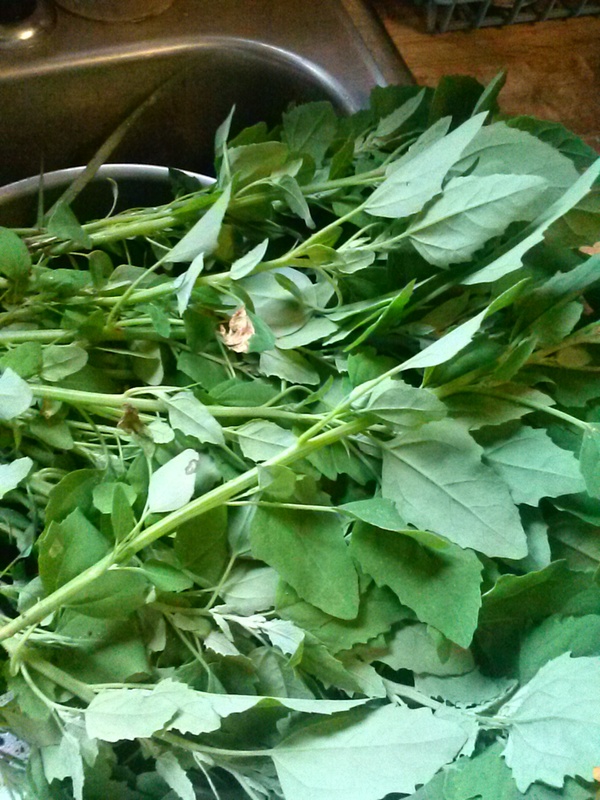 I like them but they do take awhile to get ready – I pull the leaves off the stems, rinse very well, and then steam them so they wilt, like you’d do with spinach. Lamb’s Quarters waiting for cleaning. While picking the leaves I tend to be selective, because bugs also like to eat them. I don’t want to eat bugs. That adds to the time-intensiveness of cleaning. They cook down a lot, so if you harvest, pick double what you think you’ll need. * As a caution, please always be 100% sure of what you are picking when eating wild plants. I first confirmed with several websites and pictures before eating these, just to make sure I was picking actual Lamb’s Quarters – better to be extra safe. I don’t believe there are any dangerous look-a-likes for these, but I may be wrong, depending on what part of the country or world you are in.